Let’s take a look at this flowchart to understand input and output taxes. Input tax: The tax applied on the purchase of goods or services. Output tax: The tax applied on the sale of goods or services. When a business’s net VAT is calculated, if the value is positive, then the business owner owes VAT on their account. If the value is negative, the business owner can claim input credit.The VAT taxation structure allows businesses to claim input credits for the tax they paid while purchasing capital goods for their firm. Standard-rated and zero-rated goods and services are eligible for input VAT deduction. This does not include purchases of exempt goods and services. Input VAT must be paid on supplies imported from other GCC states and internal supplies of goods within the KSA. This input VAT is eligible for deduction. Note: If goods are purchased from a supplier located in a GCC state that has not implemented VAT, the supply will be treated as non-GCC import. VAT paid on taxable supplies imported from non-GCC states can be deducted, if the import involves zero-rated or standard-rated goods or services. Input tax on capital assets may be eligible for deduction, based on the registration status of the business owner. If the full amount is paid upon the purchase of the asset, the entire input tax amount can be deducted immediately. If the payment is made in installments, VAT will be accounted for with each periodic payment, and only the corresponding amount of input tax can be deducted each time. If the asset was purchased before VAT registration and tax was paid on the purchase, input VAT can be deducted after the business owner registers. 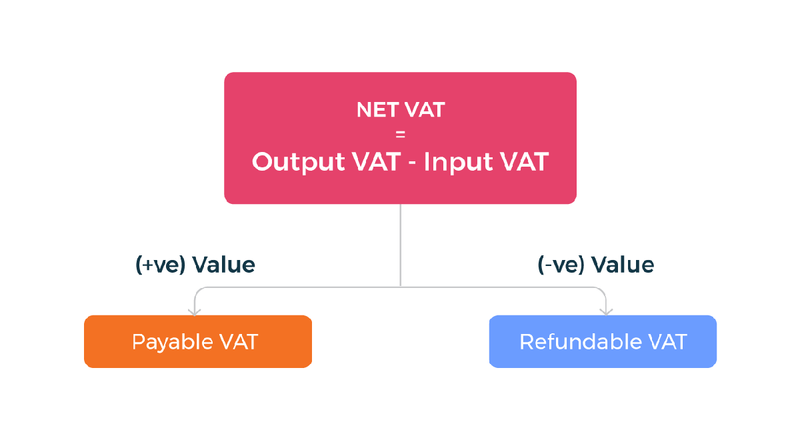 If the business uses the accrual accounting method, the input VAT for each purchase will be deducted in the tax period during which an invoice is issued for the supply. If the business uses the cash accounting method, the input VAT for each purchase will be deducted in the tax period in which the invoice amount is paid. There are three situations in which taxpayers are eligible for VAT refunds. In all three cases, the taxpayer needs to request the refund specifically. Otherwise, the amount in the VAT account is carried forward to the next tax period. If the total VAT amount owed by a business is negative for a given tax period, the business is due a refund. If a business has paid GAZT more than it owed, it can claim a refund. If a business has a positive balance in its VAT account, it can claim that amount as a refund. While filing VAT returns, business owners can request to receive any refunds associated with that particular tax return in the form of tax credits. Once this is done, GAZT will automatically carry the refundable amount forward to be applied on the next VAT return (or any other suitable VAT return filed by the business owner in the future). Can I deduct input tax while filing VAT? Can I deduct input tax on exempted supply?